Hip flasks began to appear in the form that we recognize today during the 18th century, and were initially used by members of the gentry. But there have been less compact versions of flasks in use for several centuries. They say that in the Middle Ages, they would cut out the insides of certain fruits, and fill the fruit with liquor. During the 18th century, women would take pig’s bladders, fill them with gin, and hide them under their petticoats, to smuggle them onto British warships. When prohibition started in America, in the 1920s, the state of Indiana banned the sale of hip flasks and cocktail shakers. Why Are Hip Flasks Curved? Hip flasks have traditionally been thin, with a curve and size whose shape alludes to the human kidney. The reason for this curve is simple: so that it can easily be pressed against one’s body so that it is better concealed. A curved flask fits better in a front or back pocket as it will press against one’s leg or thigh. Even a flask that is kept in someone’s boot or sock can be pressed against the leg well. Why Is It Called a Hip Flask? The name is pretty understandable – most people would conceal them alongside their hips, either in their pockets, belts, or waistbands. As such, they can vary greatly in shape, and size, although they are usually contoured to match the curve of the wearer’s hip or thigh, for comfort and discretion (as alluded to above). Hip flasks were traditionally made out of pewter, silver, or even glass, although today, most modern top-quality hip flasks are made from 100% stainless steel. Some modern flasks are also made out of plastic so the user can avoid detection by metal detectors. 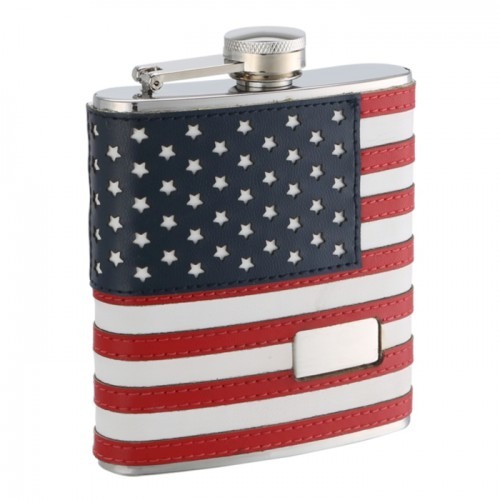 Throughout many places in the USA, it is illegal to carry a hip flask, due to the “open container” laws which prohibit possession of an unsealed container of alcohol in a public place. In terms of flying and hand luggage rules, it is permissible to carry a flask which is empty, because it is illegal for travelers to transport alcohol in an unsealed contained. U.S. laws don’t explicitly mention anything about flasks. However, UK laws are much more explicit, with two alcohol-related laws that pertain to flasks including the Licensing Act of 2003 and Road Traffic Act 1930. The Road Traffic act of 1930 was revised in 1988 and is known in some circles as the Hip Flask Defense Act. The primary facet of this law pertains to being under the influence of drugs or alcohol while operating a vehicle. However, in section 15, this Act states that the level of alcohol found on the driver was the same as when he was operating the vehicle. The obvious and interesting loophole defense here is that a driver could hypothetically drink alcohol AFTER he or she is questioned by authorities, and therefore claim that they were not inebriated at the time of arrest/questioning. The hip flask defense possibly originated with a driver stepping out of his car (after being stopped by police) and taking a swig of alcohol from his hip flask. It would obviously be hard to prove whether or not this person drank to relieve his nerves or to confuse the police. 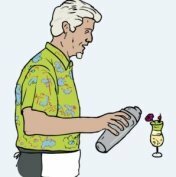 Disclaimer: Flasks.com is not a legal authority and this article should not be used for legal advice. For official legal advice on drinking and driving please contact a law firm. It does not seem likely that governments will bar the sales of flasks in the near future. Though many establishments bar them, and it is illegal in many places to drink publically, flasks are still popular and useful in certain situations. For the last hundred years, flasks have become a very common, traditional gift for a man who is about to marry, to give to his best man and groomsmen, as gifts, on his wedding day. 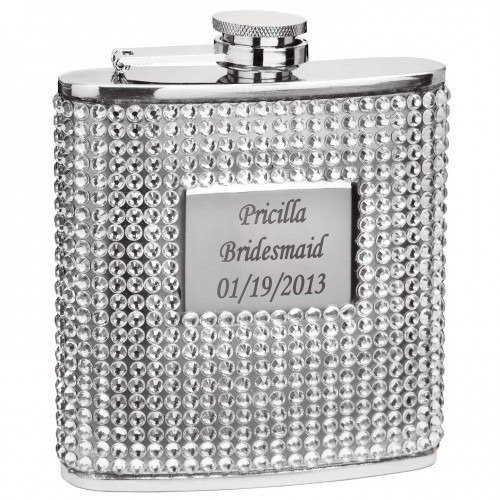 Today, many brides also give flasks to their maids of honor, as well as the bridesmaids, as gifts. The mother and father of the bride, and of the groom, also receive these gifts quite often, as the flasks can now be customized, personalized, engraved in a very impressive manner, making the flask a nice memento of the wedding day. This entry was posted in Drinking Culture, Flasks on February 8, 2016 by Chris Barton. Were King Louis XI’s Mail Carriers the First Flask Drinkers? They say that on June 19, 1461, King Louis XI created the first ever postal service, by creating royal postal roads to deliver official parcels and packages at higher speeds. If 1464 was the first year that mail carriers started work, I’d bet 100 Francs that France started selling a lot of flasks around that same time. Imagine having to be a French mail carrier in 1464? This would have been the first time that mail was ever delivered. That whole “don’t shoot the messenger” quote? I reckon it started here. This is because in the olden times, it used to be that a messenger was more of a representative of the message or package he or she was delivering, whether it was a scroll, food, or someone’s head. With the introduction of mail, however, mail carriers started to shift from representatives of the item they were delivering and more toward neutral delivery messengers. Of course, there was probably a rough transition period, as the receivers of packages likely didn’t quite catch on as quickly. As a result, mail carriers probably had to start dealing with a lot of unhappy customers. “You delivered me an Extra Large robe?? I distinctly asked for a Medium! Now how am I going to attend the masquerade and look normal! I want my Francs back and I want them back right now!”. 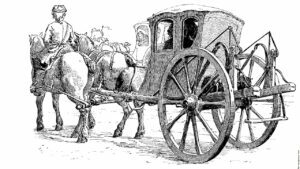 “Now, now, I’m just the messenger – here to deliver mail and be on my way!, says the mail carrier as he nervously chuckles, runs back into his horse & carriage, and likely takes a swig from his flask. Can you imagine the pressures that mailmen dealt with on the backroads of France in 1464? It was probably a very stressful job! That is why I have no doubt that flasks were definitely purchased, used, and abused by many French mailmen in the mid to late 1400’s. The question is, what sort of flasks did they carry on route? Because drinking and driving rules were probably lax back then, there was probably no issue with the amount of alcohol one consumed. I reckon that the French mailmen carried pretty big flasks back then. What, you thought that 64 oz flasks were big? Considering that they probably had a lot of spare room in their horse and carriage, mailmen probably had pouch flasks that carried upwards of 100 oz. The content of the flasks is likely not a matter of debate: Sure the French loved wine, but these mailmen needed liquid courage and relief at a much faster pace than wine. Their flasks were definitely filled with unfiltered whiskey: harsh, strong, but gets the job done. And the one alcohol they stayed away from was probably Absynthe. Because no one wants a hallucinating mailman. This entry was posted in Drinking Culture, Flasks on June 18, 2015 by Chris Barton. 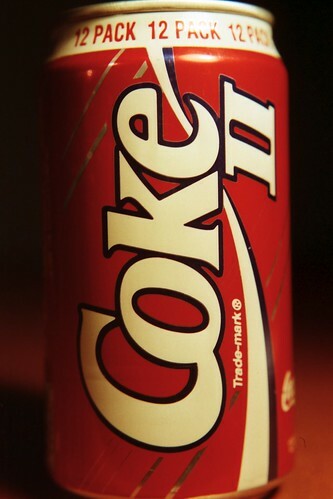 On this day in 1985, Coca-Cola introduced New Coke. The backlash to it was so strong that 30 years later, people are mindful of it and nervous of experiencing the same fate. Notwithstanding, innovation is an essential component in becoming and staying a successful company. Any company that is still in business and older than 100 years is only around because it adapted with the changing times. And New Coke didn’t spell the end of all Coke product launches. Coke Zero, Coke with Lime, Coke with Lemon and Coca-Cola Life all came after New Coke. So why was New Coke such an unmitigated disaster? Because consumers were so attached to the original taste that New Coke was too much of a deviation for them. New Coke may have even been a superior product to the original drink, but it wasn’t what they were used to. Consumers don’t buy what is defined as the absolute best, they buy what is their best. When Coca-Cola scrapped New Coke and reverted back to the original one, sales of Classic Coke skyrocketed. So much so that many skeptics felt the whole thing from start to finish was planned. Making alcohol is a time-honored process going back hundreds of years and while technology aids the process, today’s end product is very similar to what you were finding in flasks hundreds of years ago. Learning from New Coke, if makers of alcohol are going to change anything, instead of the new replacing the old, the new needs to complement the old. In this regard, Johnnie Walker has Red Label, Black Label, Blue Label and the like. It’s the changing of the status quo that upsets people. When Maker’s Mark announced in February 2013 that it was reducing the alcoholic strength of its bourbon whiskey from 45% to 42%, there was a massive backlash. 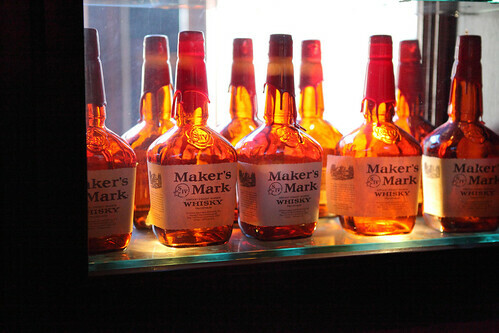 8 days later, the feedback and outrage from customers was so strong that Maker’s Mark had no choice other than to restore the alcohol levels to what they were. Many couldn’t help but make the comparisons to New Coke. 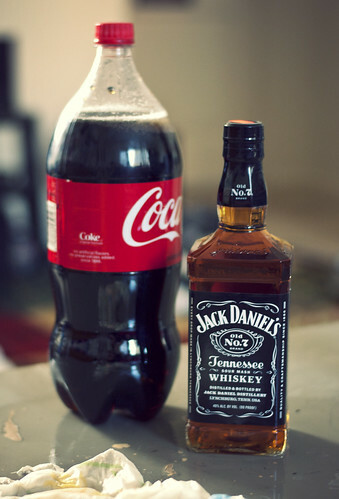 Similarly the decision was made in 2002 to reduce the proof of Jack Daniel’s black label from 90 to 80. Social media wasn’t as sophisticated then, so while there was somewhat of a backlash to it, it wasn’t to the same degree. One doesn’t drink Coke like one sips bourbon whiskey and therefore a change in taste due to a reduction in proof won’t be that noticeable, especially for casual drinkers. Taste is a very personal thing. If you asked 100 people what they had in their flasks, you may be surprised by what the answers are. Different people like different things. And a person’s attachment to a particular brand isn’t solely due to taste – it can also be due to drinking it at a very special time and so one develops an attachment and fondness to it. The more of the story is that whatever their favorite it, you don’t want to mess with it! This entry was posted in Drinking Culture, Flasks, Whiskey on April 23, 2015 by Chris Barton. On this day 60 years ago, Ray Kroc opened the first McDonald’s as we know it. 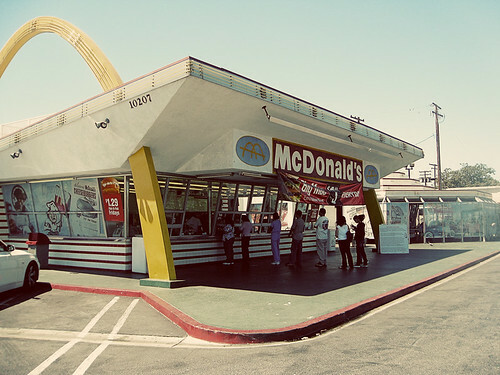 Of course McDonald’s existed previously – it was created in 1940 by the McDonald brothers, but the McDonald’s we know today has its roots with what Kroc created on April 15, 1955 in Des Plaines, Illinois. Kroc wanted to take control of the company as he didn’t feel as though the brothers sufficiently recognized the potential of the restaurant. They only wanted to have a small number of branches, while Kroc wanted to conquer the world and conquer it he did! Now it is impossible to imagine a world without an omnipresent McDonald’s. They have 35,000 branches in over 100 countries. 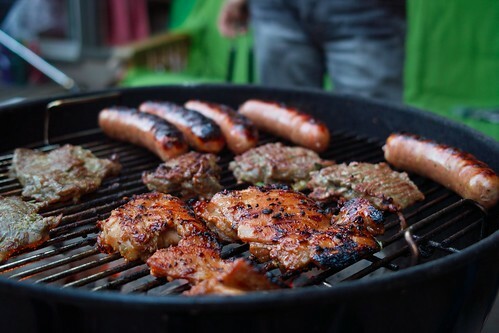 If one was going to have a barbeque and make their own hamburgers, what would be the drinks to accompany it? Fast food restaurants have been serving alcohol for a while and if you go to any pub they are likely to have food to go with the drinks. Beer is choice of many especially during the hot summer months, but what if you wanted something a bit more sophisticated? New York Sour – this whiskey sour with red wine on top is great because it looks like a combination of mustard and ketchup. Like many other drinks, this has existed under a number of different names, but whatever you call it is tastes delicious. Margarita – this is a great drink to have at any time of the day. The combination of tequila, lime juice and Cointreau results in a magical mixture of sweet and salty that is great for getting the party started or washing the meal down. The drink’s merit seems so obvious that it would have invented itself and as such there is a debate about the origins of it. Whiskey – When it comes to steak, it’s traditional to pair red wine with it, but 21st century drinkers aren’t so wedded to outdated and ancient traditions. There is nothing wrong with kicking back at a barbecue with a flask. In fact, nothing washes steak and whatever else you may consume at your barbecue than a single malt. It will put the finishing touches on a great meal. With the family values at McDonald’s don’t expect to see whiskey or cocktails on their menu, although in some of European countries they serve beer. Given Ray Kroc’s family comes near Plzeň in the Czech Republic he would definitely approve of this. This entry was posted in Beer, Drinking Culture, Flasks, Whiskey on April 15, 2015 by Chris Barton. Although the PGA golf tour has been happening since January, there is something about the US Masters, the first major of the year to make it feel as though it’s arriving. The US Masters signals the fact that spring is here and the spring weather is far more conducive to playing golf. Golf and flasks have a rich association. Part of this is due to golf and whisky both having their roots in Scotland – they share a relationship that is hundreds of years old. When you are spending a day on the links and it’s cold and windy, you definitely want to have a flask in your golf bag for medicinal purposes. 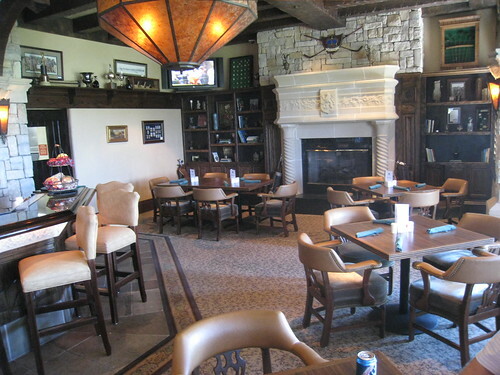 Drinking on the golf course is mostly saved for the 19th hole. After a long day on the course, there is nothing like kicking back and discussing the round. The hyperbole and exaggeration revolving the great shots only increases over time as does the agony over the tight misses. We have a number of flasks with a golfing theme, so if you have any family or friends who are avid golfers, these would make a great gift. 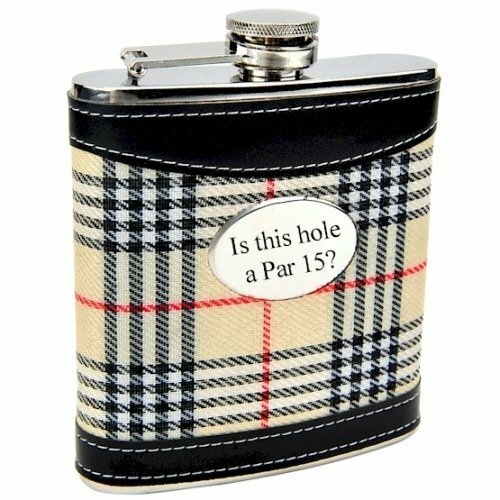 The 6oz Plaid Flask for Golfers is one such flask. The plaid really contributes to the golfing feel. There is a space there to engrave so you could commemorate a very special round or shot. Then there are the 6oz Plaid Cloth and Faux Leather Hip Flask and 6oz Plaid Golf Flask with Faux Leather Accents. Both of these flasks also allow for engraving. 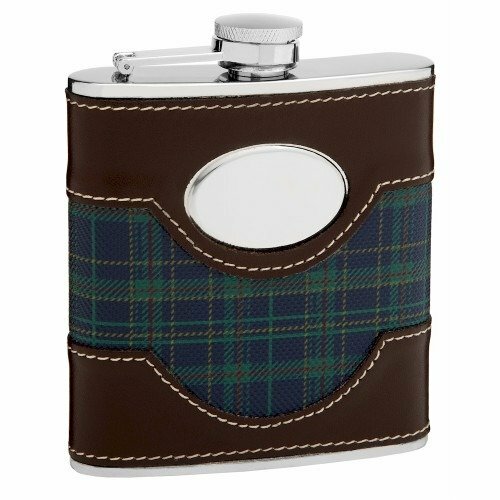 If you want to pay homage to the Scottish roots of the game you can do so with the 6oz Plaid Golf Hip Flask with Faux Leather Trim. The plaid here has a tartan theme that looks very much at home on the golf course. 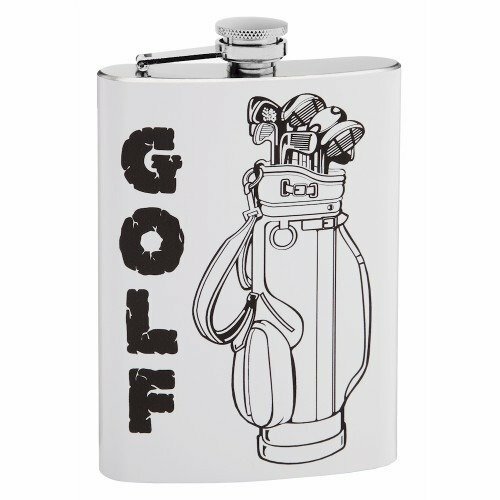 For those who love their golf and their flasks, the 8oz Golf Theme Drinking Flask is very popular. 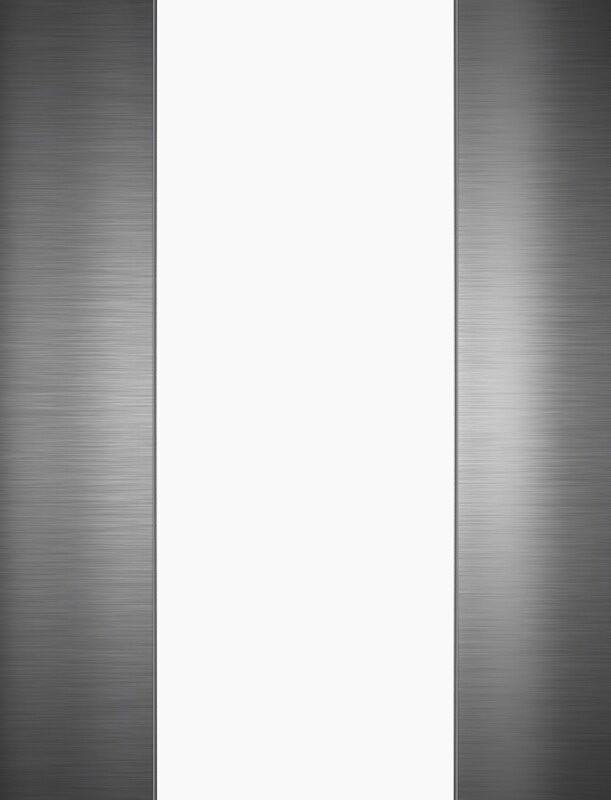 If you would like to tweak the design, this flask is a custom flask and so the print and the background can be changed as per your modifications. Whether you want a flask for yourself, your golfing partner or all of your golfing buddies, we are here to help. This entry was posted in Drinking Culture, Flasks on April 7, 2015 by Chris Barton. We saw this article, regarding gifts given to the British Royal Family in 2014 and someone had the good sense to present them with a flask. This got us thinking about the flask we would give to various celebrities if we had the chance. Taylor Swift – If any celebrity walks the tightrope between naughty and nice it is Taylor Swift. 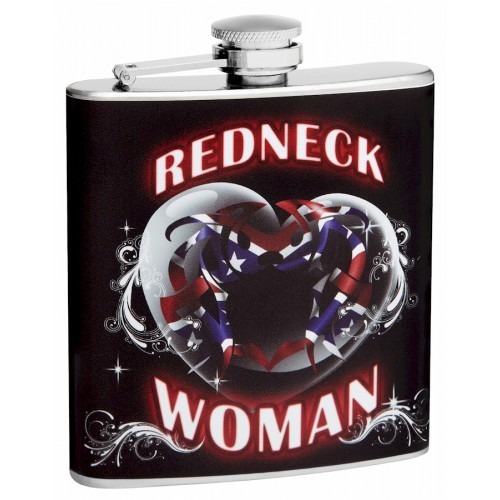 If she had a flask she would like one such as this one. Shake it off indeed! Kim Kardashian – this first lady of reality TV and the internet tried to break it with her photos. 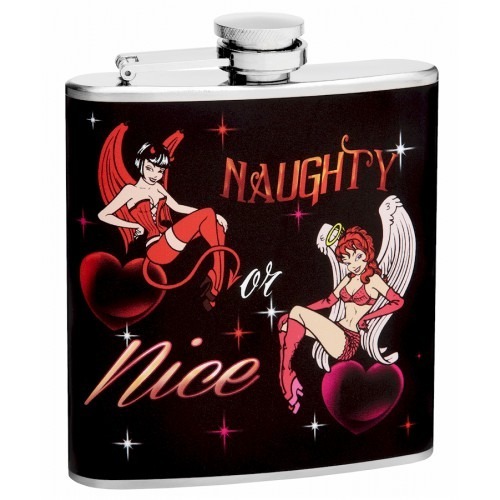 What could be more fitting for her and her image than a silver crystal bead and rhinestone 6oz hip flask? 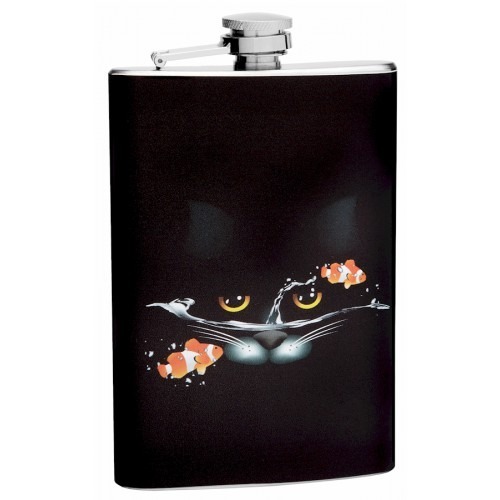 Kanye West – Of course Kanye doesn’t want to be left out so we have a Fading Sat Cat with Clown Fish Hip Flask for him. Lena Dunham – No one divides opinion like Lena Dunham. 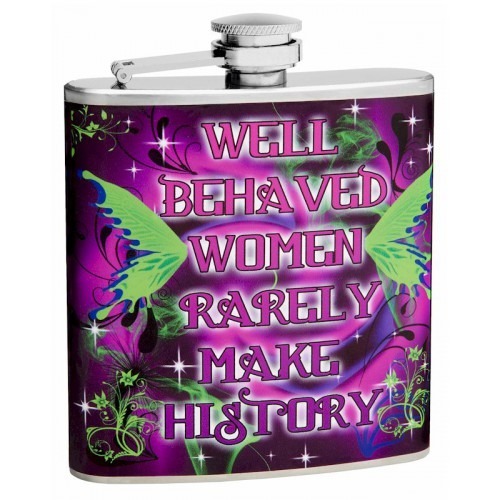 The star of Girls likes to push the envelope and be provocative so this 6oz Well Behaved Women Rarely Make History Hip Flask would be the perfect gift for her. 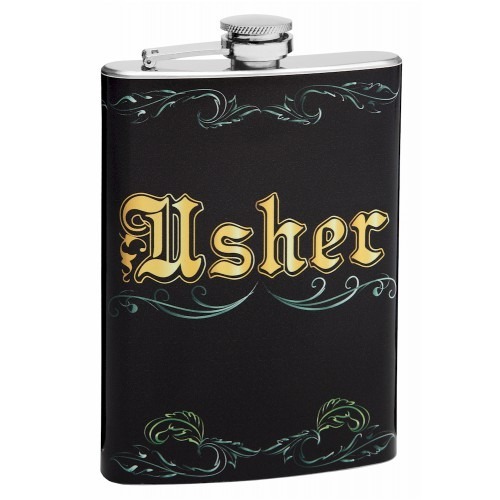 Usher – What could be a better flask for this entertainment superstar than one that has his name on it! 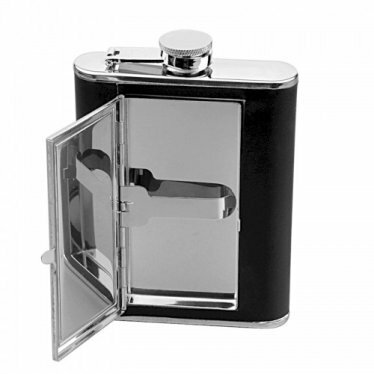 This 8oz wedding flask is ideal for him. Brad Pitt – Despite being a very busy actor and producer, Brad Pitt’s six children are very near and dear to his heart. 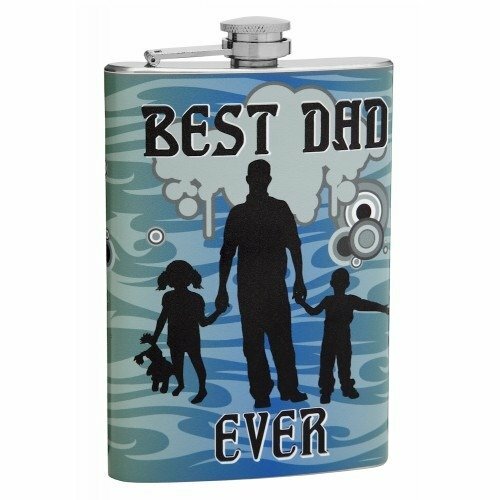 As such this 8oz Best Dad Ever flask would make a fine gift for him. When he is away on set, he will definitely appreciate it. Derek Jeter – When someone retires it is customary to get them a gift such as a flask. When it comes to Derek Jeter, it is a great gift given how hard it is to find a gift for the person who has everyone. Given his salaries and endorsements there is nothing the Yankee skipper would want for. Additionally he already received a bunch of gifts from all the teams he played against in 2014. When he is sitting on the bench that the White Sox gave him, listening to Yankees games, one of our retirement flasks will provide him with the perfect company. Beyonce – The Bootylicious star definitely does not want for anything so if you want to find a gift for her that she would really like, it needs to be something unique. The mistake people make is to think a person like Beyonce would need something big and glitzy, but in reality it’s the little things that would find their way to her heart. 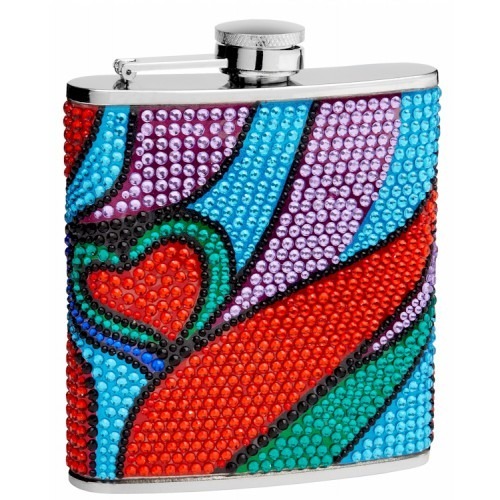 One such gift would be this 6oz Beaded Hip Flask with Actual Rhinestones. Could see her taking this with her on tour. Barack Obama – Any flask for the first drinker of the United States needs to have an American theme. We have a few and considered Uncle Sam and also a flask with a golfing theme. In the end we thought nothing could be more suitable for POTUS than a flask featuring the stars and stripes. Michael Jordan – His Airness is well known for Chicago Bulls colors red/white and red/black, but he will forever be connected with the blue of his beloved Tar Heels. He would love nothing more than to drink out of a blue flask. Floyd Mayweather – The boxer known as Money is well known for his love of displaying piles and piles of money. As such, this is the ultimate flask for him. June Shannon – You may not recognize who this person is by name but you may do so by her nickname Mama June or as Honey Boo Boo’s Mom. She is the poster child of redneck women everywhere! As such, this is the optimal flask for her. So there you go. Next time you need to buy a gift for a celebrity, you will have some insight as to what to get them and more importantly, you will know where to get it! This entry was posted in Flasks on April 1, 2015 by Chris Barton. 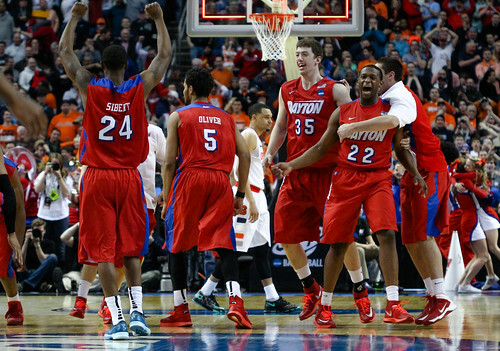 March means March Madness which means 63 incredible games of College Basketball. The NCAA Tournament is one of the biggest sporting events in the world and the 2015 version of it is about to get under way. Part of the reason for the massive popularity for the tournament is it reconnects people to their college days. Cheering for their alum takes them back to the days when they were college students. What better way to support your favorite school than a college themed flask? We have a wide range of them. Our 8oz Custom Engraved College Fraternity Hip Flask is a very popular flask and would provide a great accessory to watching the games. Instead of a fraternity featuring on it, you can have the logo of your college engraved onto it. A big part of March Madness is color. The uniforms, the mascots, the cheerleaders, the T-shirts of the supporters, will cause the stadium to be divided into two colors. Some schools are well known for their association with certain colors; the blue of Duke, Kentucky and Kansas, the red of Arkansas, Ohio State and St Johns and the like. What this means is that you can buy a flask of color that provides a strong association with your school of choice. 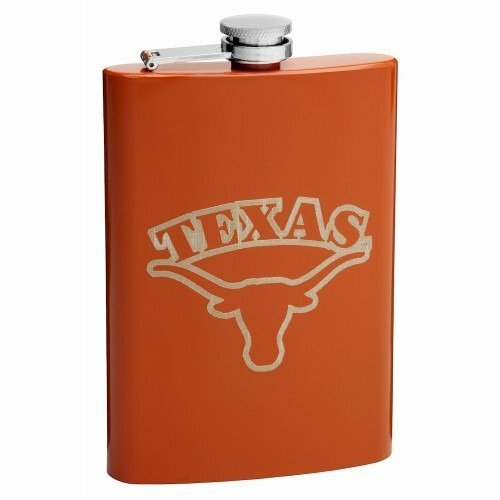 Syracuse isn’t there this year, but this Orange Hip Flask is great for those who have a strong connection to the color. Texas are competing, but will struggle to go far in the tournament. The great thing about a flask is that regardless of the result it is going to provide you good company. If your team wins, then what could be better than celebrating with a drink? And if unfortunately your team gets beat than a drink is a great way to drown your sorrows. This entry was posted in Drinking Culture, Flasks on March 19, 2015 by Chris Barton. Who else watched the Oscars ceremony and saw Benedict Cumberbatch take a swig from a flask? We just saw Wild, the movie starring Reese Witherspoon. Towards the start of her adventure hiking 1,100 miles of the Pacific Crest Trail by herself, Witherspoon realizes she packed the wrong things and thus is out of food. She flags down a truck and gets into it even though she doesn’t trust the driver 100%. What choice does she have? They talk for a bit, he hands her a flask – she drinks and so a friendship and bond is formed. This got us thinking about movies/television and the part flasks play in them. We’ve always paid special attention whenever flasks were present. We knew that we would only be able to scratch the surface so we reached out to three popular-culture experts to ask them their thoughts. Before we begin, let us say that by no means is this a definitive list – so for any major omissions, please forgive us and send us the omitted instances. Details of this are at the end. 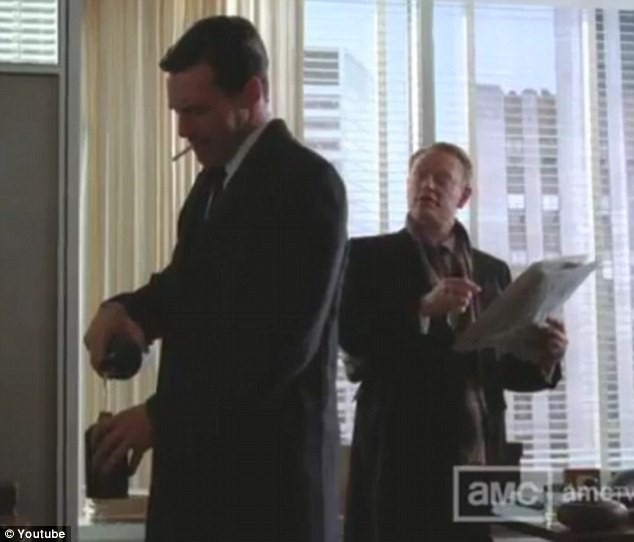 Flasks have a rich place in movies and TVs as a prop. Like any prop, they provide depth to the character. Of course who can go past Marliyn Monroe in Some Like It Hot. Not only does she have a flask, but a garter flask at that! Nicholas Cage won an Academy Award for his role of Ben Sanderson in Leaving Las Vegas. In the movie’s pivotal scene, Elisabeth Shue hands him a silver flask. 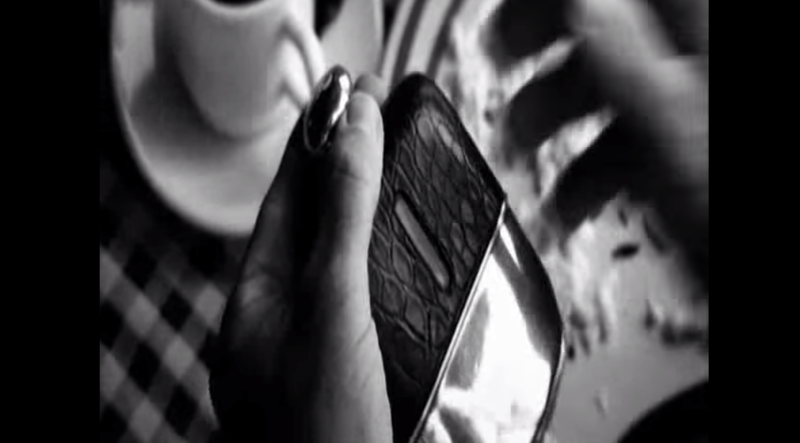 The flask isn’t just a flask – it is a symbol representing her acceptance of his drinking. It is this scene that won Cage the Oscar. Going as far away from an Academy Award winning movie as one can we have Little Nicky. 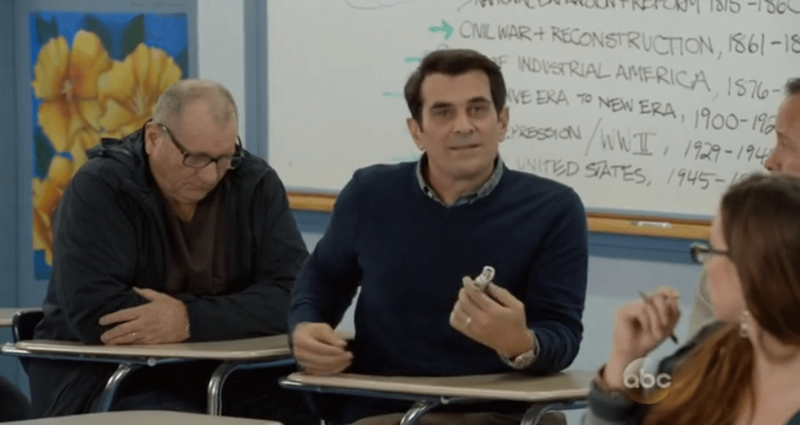 The flask plays a pivotal part in the movie and the quote “get in the flask” is well known. Harry Potter fans will be familiar with Mad-Eye Moody and his flask. 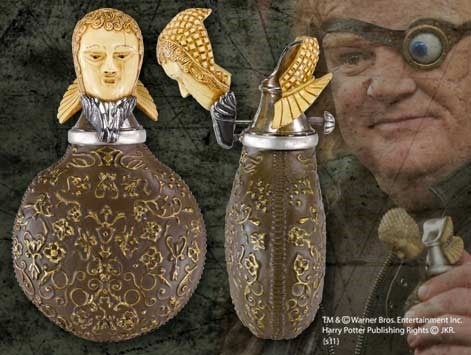 Then there’s a movie flask of Alastor “Mad-Eye” Moody from the Harry Potter series — a flask filled with an actual magic potion. Moody is fearful of the darker side of the wizarding world, so he drinks exclusively from a flask he keeps on his person as all times to ensure no one slips him an evil potion. 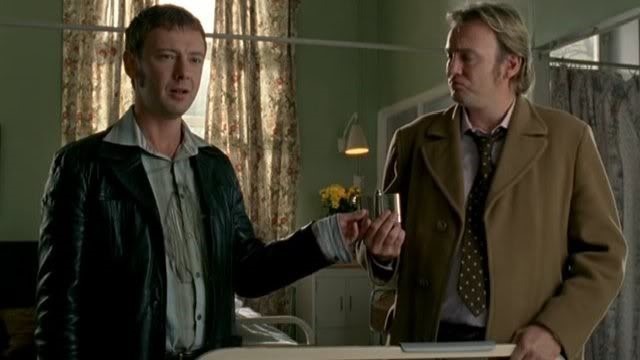 Thematically, the flask represents two things: the first being Moody’s paranoia (which is proven to be justified after he is kidnapped and is replaced by a villain who uses the flask to drink a potion that transforms him into a Moody body double), and the second being trust. In a pivotal part of the series, Harry and his collective are being hunted by the villainous Death Eaters. Moody makes everyone drink a potion from his personal flask that transforms his friends into clones of Harry to confuse attackers. Before this, Moody is highly personal and rarely allows anyone into his life, as represented by his usage of the flask. 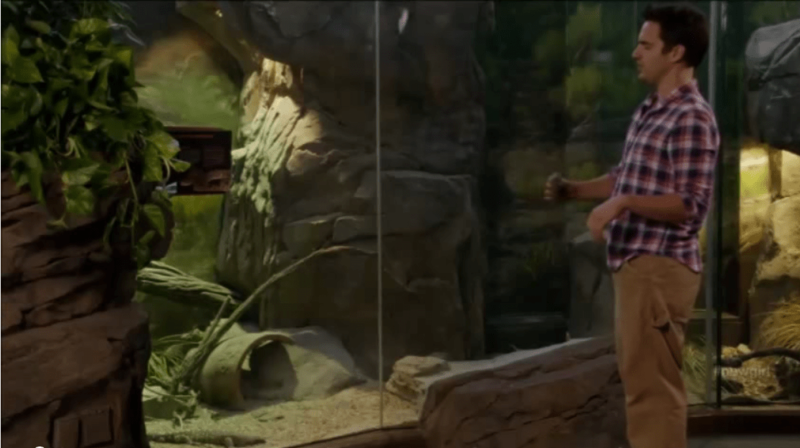 By allowing others to drink from the flask, it shows his evolution as a character; that he’s reached a point where he has finally found people he can trust. 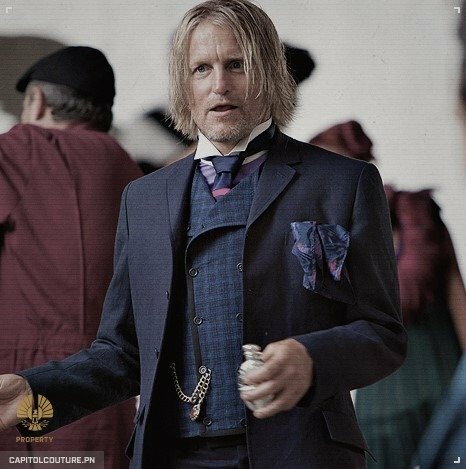 In the Hunger Games, Haymitch Abernathy played by Woody Harrelson likes to have a drink. His relationship with alcohol is plays a pivotal part with this character. 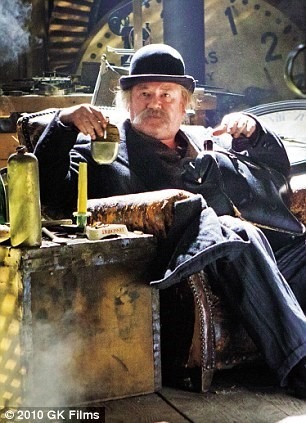 In Hugo, Ray Winstone plays the alcoholic uncle of Hugo and they feature a flask to illustrate his love of a drink. We spoke to Kevin Maher, a pop-culture expert and the host of the live series “Kevin Geeks Out”. National Lampoon’s Animal House features all kinds of drinking, but one of the more pointed portrayals comes from Verna Bloom’s Mrs. Wormer. As the wife of the evil college Dean, Marian Wormer is part of “the establishment”, but she doesn’t pass up an invitation to a frat house toga party. Mrs. Wormer arrives late (having just come from the “God-damn senior honors dinner”) and crashes her Buick station wagon in front of the Delta House. Before entering the party, she takes a long pull from the silver flask stashed in her purse. In a booze-heavy movie, Mrs. Wormer is the only character to use a flask. The snobs from the Omega House drink (imported?) beer from ceramic German mugs, while the Delta slobs guzzle Jack Daniels straight from the bottle. But Mrs. Wormer’s thirst is something that’s kept concealed. The flask reflects a bored housewife’s double-life. Unlike the joyless villains in the movies, Mrs. Wormer has a vice (and not just screwing a college kid who’s almost old enough to be her son) – her drinking humanizes her and makes the Dean’s wife much more relatable. The Animal House novelization includes Mrs. Wormer in the extended “Where Are They Now?” post-script, noting that she went on to five unsuccessful stints in A.A. Wherever she is now, her flask is probably with her. Life on Mars wasn’t on television for long but that hasn’t stopped it from becoming a cult classic. What time traveling policeman wouldn’t want to make use of a flask? 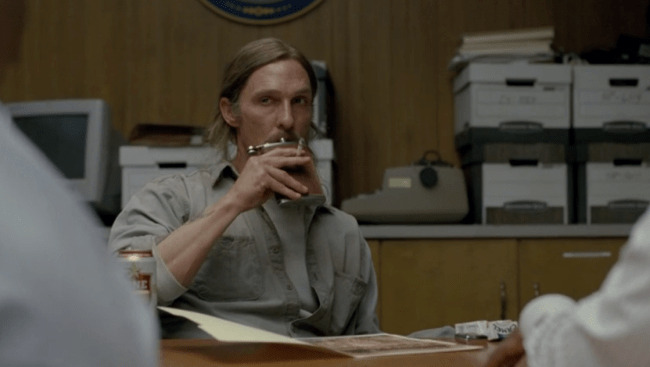 Rust Cohle flew across our screens like one of the meteors he would like to stare at. Given what he’s seen and what he’s been through, he definitely needs a drink! This is an under-rated thriller starring Brad Pitt and Robert Redford. We were reminded of it by pop culture expert, Sam Meyer – . Apparently there’s a gift of a flask in “Spy Game”, but I haven’t seen that movie. And Sam is right! In a a critical scene, Pitt hands Redford a flask. Nick’s love of a drink is well known! If anyone knows Don Draper they know his love of a drink, especially during business hours! 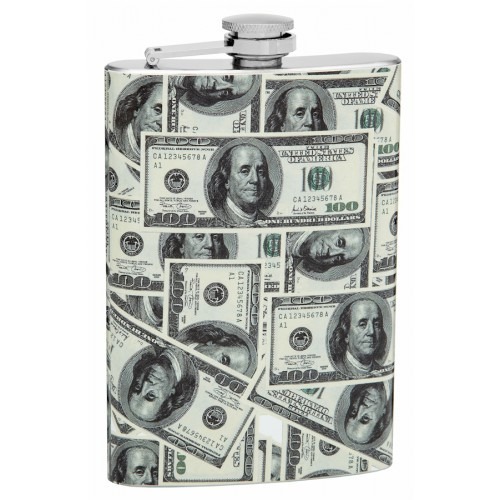 If we failed to mention any instances of flasks in popular culture that you know of, please email sales@flasks.com and we will update the post and send you a free flask upon request! This entry was posted in Flasks on March 10, 2015 by Chris Barton. Some people see things in black and white, but forget about shades of gray, there are so many more colors out there! We at flasks.com are embracing this with our selection of colored flasks. 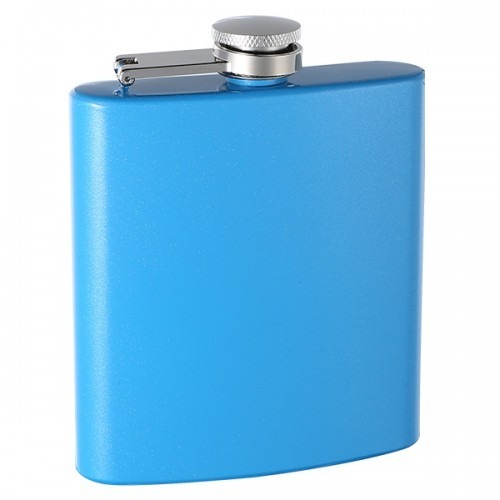 We’ve always had flasks in many different colors, but not as a section on our website. We began by adding black and pink and have since added blue, brown, green, purple, red and white. Some of the flasks we have such as the Blue and White Zebra Print 6oz Hip Flask or 6oz Purple and Green Cheetah Skin Printed Hip Flask are a combination of two colors. So what does your choice of color say about you? Sometimes the choice may be dictated to by circumstances such as groomsmen or bridesmaids flasks that to be consistent with a color choice, but at other time, the choice is going to be an indication of your personality. Blue – A color that related to peace, truth, calmness and serenity. You are very comfortable with yourself and you put a high price on loyalty. Brown – There is nothing more important to you than your family and friends. You are honest and practical. Green – You like to feel safe and secure and green gives you a sense of being loved. You are more of an outdoors person. Purple – A color that symbolizes spirituality, romance and being a very giving and selfless person to others. Red – A very sensual and passionate color, you use all five of your senses to appreciate life. You are a bit of an extrovert. White – You are a low-maintenance and independent who is self-reliant. Neatness and presentation are very important to you. Pink – Love is a very important part of your being. You give a lot of love and receive it back in return. Women are obviously going to gravitate more towards to this color given the strong association between it and females. If a man chooses a pink flask, he is very self-confident! While there are dominant traits in each of our personalities at times we feel more brown than green or more purple than black. This is why it helps to have flasks in multiple colors – by doing so, you cover all of your bases. This entry was posted in Flasks on February 10, 2015 by Chris Barton. If you are looking for an original gift for your bridesmaids or maid of honor, you should consider a flask. Flasks have long been associated with groomsmen and the male side of the wedding party, but nowhere is this locked in stone. A personalized flask is going to be a very special and original gift. It defies the typical and traditional gifts such as jewelry and other fashion accessories. The great thing about choosing a flask as a gift for your bridesmaids is that you have the scope to go from conservative to a bit more daring. The stainless steel and pink flasks are on the more conservative end of the spectrum and then there are the beaded and glitter flasks on the other end. 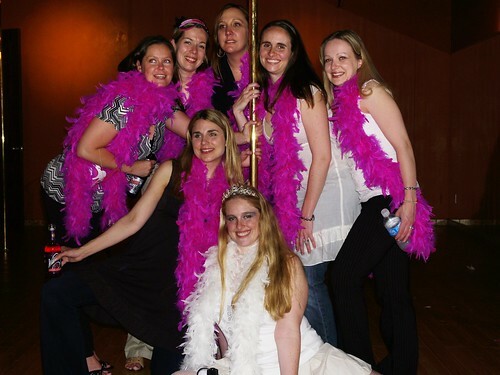 The flask is the perfect bridesmaid accessory for a bachelorette party/hen’s night. When a bunch of girls are going out on the town, what could be better than having personalized flasks with them? Here flasks are very much keeping in line with the tone of the evening and are going to provide a very special memento of it, especially when recollections could be a bit hazy. As was mentioned in our earlier post about groomsmen and flasks, it’s beside the point if the flask is used after the wedding because it is going to provide a fantastic memory that is going to last the test of time. But there is no reason why the flask has to sit on the shelf and gather dust. The medicinal values of an occasional stiff drink can’t be disputed. 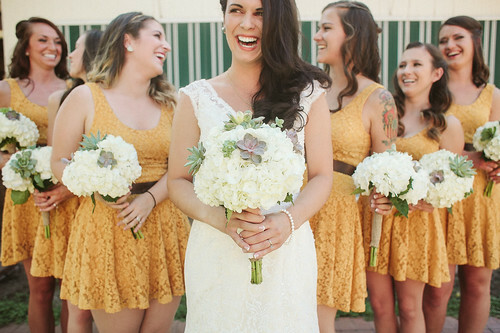 While weddings are fun and exciting, they can also be stressful especially for those in the bridal party. Those who say they have no need for a flask, may be saying something different once the wedding is over. This entry was posted in Flasks, Weddings on February 4, 2015 by Chris Barton.